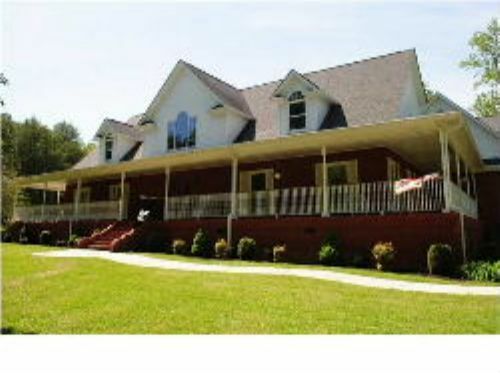 This is a beautiful custom brick home with wrap around porches is tucked away on almost 13 acres for complete privacy. The property features a stocked pond and gently rolling pasture currently used for horses and additional pasture area that could be used for another paddock beside the all brick workshop. The home is 4 bedrooms with the master and an additional bedroom, currently used as an office, on the main level. Upstairs features two very large guest bedrooms with a Jack and Jill style shared bath. Off of the back porch the home has an in ground swimming pool that can also be accessed from the side patio area and an all brick pool house with another bath. This brick workshop also has a full bath and central heat and air and its own 1000 gallon buried propane tank. Inside this home the floor plan flows smoothly from one room to the next, In the kitchen there is plenty of room for gatherings and the custom kitchen has maples cabinets, solid surface counter tops, stainless steel appliances, electric corner fireplace, and a large island. From the kitchen it is easy access to the formal dining room or family room and even the sunroom. Gas logs are in the family room and also in the master bedroom, so no need for cutting or hauling in firewood. The master bath has a very large walk in tile shower with multiple jets and a separate 6' whirlpool tub and double sink vanity. The home also has a large bonus room with a full bath that could be a second master if a closet was added. Plenty of room for your vehicles and additional storage in the three car garage just steps away from the pond and the workshop. The property is ideally located in Rock Spring for country living but is very close to Chattanooga and I-75 access in Ringgold.